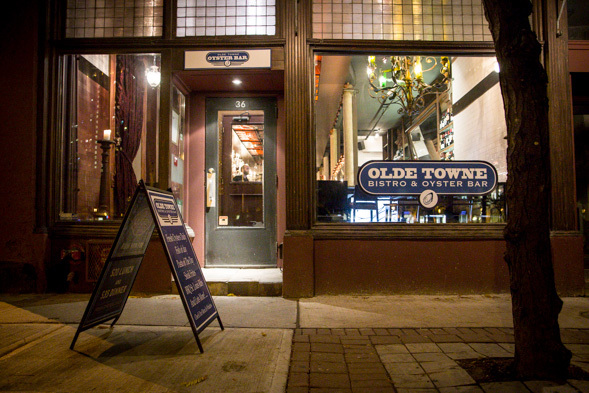 Olde Towne Bistro & Oyster Bar is now open in place of Lucien on Wellington St. across from the Flatiron building. Management remains the same, the interior hardly touched, with the main difference being the sign over the door and the new focus on small plate bistro fare with generally softer prices than you'd find at its predecessor (where mains hovered around the $30 mark). It's a cold Monday evening when I visit, and none of the neighbouring bars or restaurants are especially busy, no exceptions here. There are several tables taken up front and pairs seated at the bar enjoy the cozy vibe set by warm lighting, textured with subway tiles, tanned leather swatches and deco-inspired ironwork. 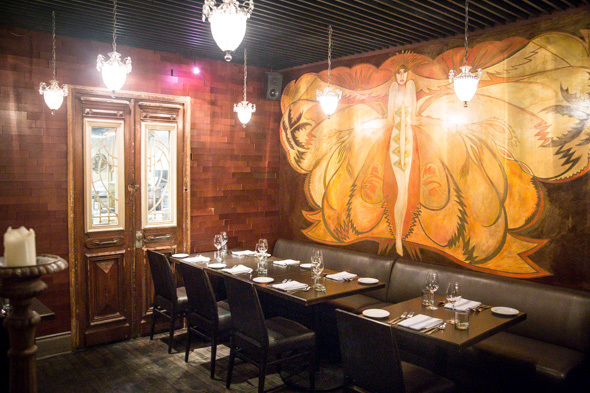 In the back, a semi-private space features an ethereal, golden-toned mural. The menu from from Keith Hosein (formerly of Table 17 and Goods & Provisions ) and Damien Haze (formerly of Globe Earth Bistro ) is printed daily and at minimum will feature new mains each night including a braised dish, fresh fish and house-made pasta. 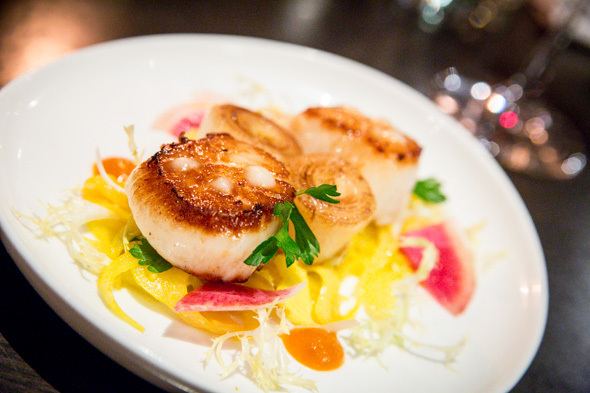 The list of small plates highlights classic bistro fare and seafood specialties. 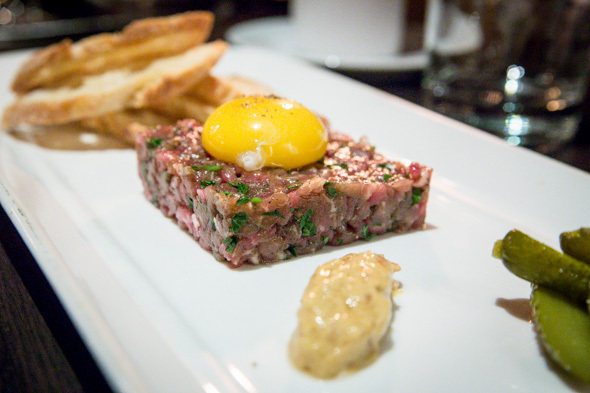 Tonight, I'm lucky enough to find a hand-chopped Tartare ($14) and Country Terrine ($10) listed alongside oysters ($15 a half dozen) and Tempura Shrimp ($11). 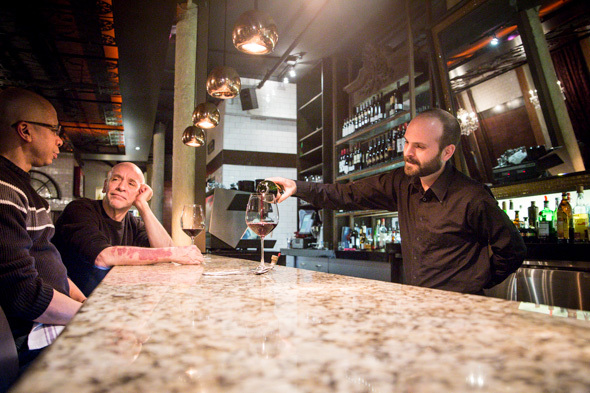 The bar menu is mainly dedicated to wine, offering ample selection by the glass ($9-$15). Cocktail standards are available on request and it's Steam Whistle on tap alongside a rotating selection of bottles and cans. I try the Seared Scallop ($11) dotted with house-made horseradish cream and accompanied by gently charred leeks. It's served over a delicate citrus and pickled leek and heirloom beet salad that balances the sweet seafood with tart veg. 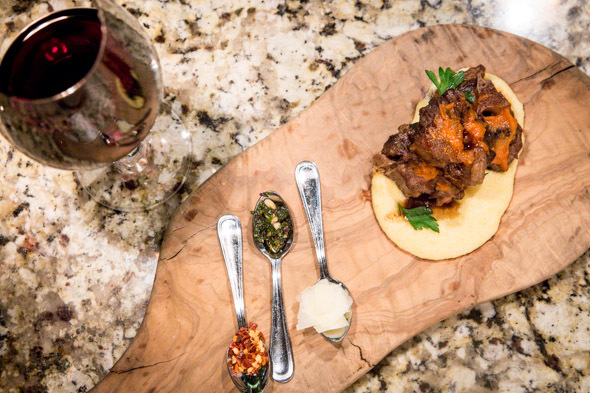 It's delicious but truly a "small plate," which only leaves me wanting more. Next comes Braised Oxtails ($11) dressed with a tomato onion jam over a bed of creamy polenta. Grana Padano shavings, chilli flakes and salsa verde are supplied in little spoonfuls on the side to cut through the richness. 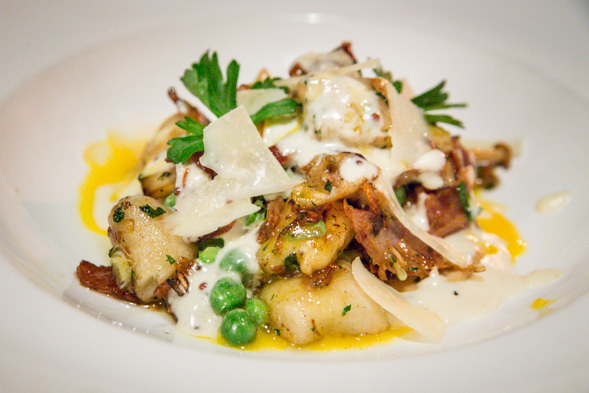 Tonight's pasta is a house made gnocchi ($17) with wild mushrooms and house-cured duck prosciutto carbonara. It's not on my plate this visit, but after seeing it, I feel a tinge of envy. 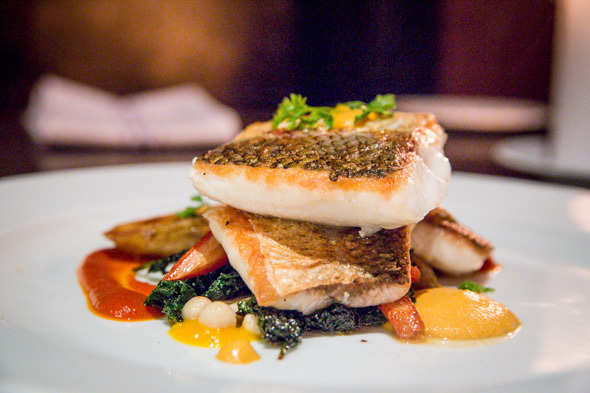 I have the daily catch, a pan seared Lake Erie Whitefish ($18) served with fingerling potatoes, crispy red chard and enoki mushrooms over swooshes of almond and red pepper Romesco and ginger-carrot puree. 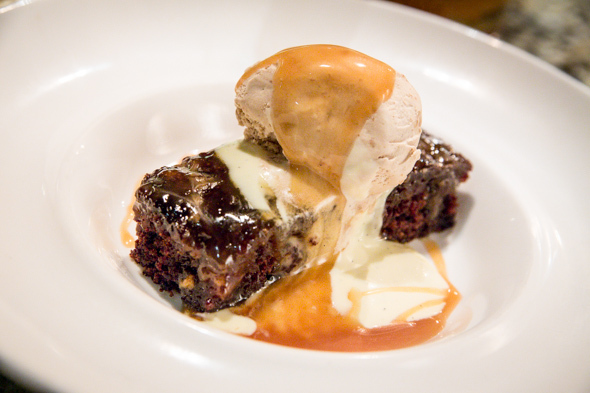 To end, there's a choice of Artisanal Cheeses ($16) or sweets like a classic Creme Brulee ($9) or Sticky Toffee Pudding ($9) topped with caramel ice cream. Olde Towne Bistro & Oyster Bar is open daily from 4pm and features drink and oyster specials for the after work and pre-theatre crowd. 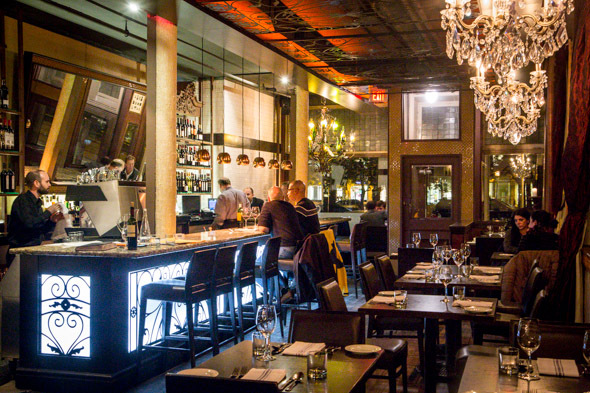 The kitchen stays open until about 10:30pm, though oysters, cheese and desserts are available later.